Following the publication of the article 4.0 in PLX, the Cong Thuong (Industry & Trade) magazine made a field trip to Petrolimex Quang Ninh. On the occasion, Chairman and Director of Petrolimex Quang Ninh, Nguyen Dong affirmed that: Technology brings about practical effects for Petrolimex Quang Ninh. After 40 years of establishment and development, Petrolimex Quang Ninh has equipped itself with a synchronous and modern infrastructure system, including: Oil port capable of accommodating 40,000DWT tankers, and receiving over 4 million cubic meters of petroleum annually; five oil terminals with a capacity of nearly 400,000cu.m connected with nearly 600km of pipelines running through six provinces/cities of Quang Ninh, Hai Phong, Hai Duong, Hung Yen, Bac Ninh and Hanoi and 120 petrol stations in the localities of Quang Ninh, Hai Phong, Hai Duong and Hung Yen. Such infrastructure system helps Petrolimex Quang Ninh accomplish an extremely significant mission, that is: to ensure petrol and oil supply for socio-economic development, ensure the national energy security for most of provinces and cities in coastal areas, midland and northern mountainous region, and ensure national petroleum reserve. Nevertheless, the management of such diverse and widespread infrastructure system is also a relatively difficult problem for Petrolimex Quang Ninh. Therefore, Petrolimex Quang Ninh has always pioneered in applying information technology (IT) into its management work for years. The IT has not only renewed management manner but also facilitated decentralisation – one of the most effective tools that help the enterprise develop strongly and sustainably. To put it simple, Chairman and Director of Petrolimex Quang Ninh Nguyen Dong said: the company has a system of warehouses, ports, pipelines, and retail enterprises. In order to manage such system and decentralise each part of the system, the highest level of management must be well aware of what they have in their “pocket” and how they are operating. The ultimate aim of science and technology application or software development is to enhance such awareness and operate it optimally. 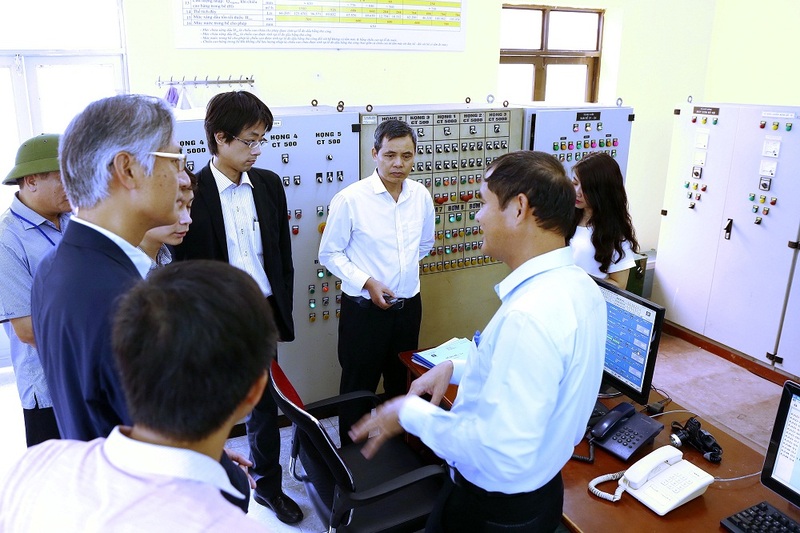 When we visited the Petrolimex Quang Ninh’s Central Control Room, the company’s “pocket” is clearly shown on three screens. A staff on duty named Tuan said: the first screen is the automatic level meter which timely and accurately reports stock data at warehouses, the second screen monitors oil pumping on pipelines, and the third screen monitors the shipment at oil terminals. Looking at the screen, outsiders like us also know that petrol is being discharged from and charged into the Oil Depot K131 in Hai Phong City at a speed of 119cu.m/h and 138cu.m/h respectively. Figures on the nearby screen change continuously, showing every single litre of petrol being discharged into tank truck, barge, and ships. Watching the figures change continuously makes us dizzy. However, we do understand that these figures are of overriding importance to the Company’s leaders. On a visit to Oil Depot K130 – the heart of Petrolimex Quang Ninh and a northern petroleum supply, we met Nguyen Dinh San who is on a duty. San said previously work was done manually but now the whole system is automatically controlled thanks to information technology. “All we need to do is to sit here at the Central Control Room and work on the computer,” he said. All parameters of oil tanks such as the height, temperature and volume of the liquid, petroleum charging and discharging states are all shown on screen. The data are also shown on the monitor at the foot of each oil tank. The key difference is that before workers had to climb into tanks to check, which means tanks were checked several times a day, but now tanks are checked round the clock. In addition, San said, in the past if any incident occurred it usually took 8 hours or even a working day to fix. “With the automatic level meter, incidents rarely occur,” he said. If one parameter reaches the dangerous threshold, the system automatically switches itself off to ensure safety. Till now, Petrolimex Quang Ninh has built up a set of automatic systems including: Automated system for ocean freight shipping; Automated system for road freight transport; Automatic level measuring system; Automatic reporting system; Main pump station automation system; Automated line pumping control system (in-line flow meter); Tank overflow warning system; and CCTV camera system. Of note, the company has integrated these automated systems into the Central Cargo Control System which is considered a “brain” of the company. Concurrently, Petrolimex Quang Ninh is also one of the first units that implemented the Group’s policy when successfully deploying the enterprise resource planning software (ERP) and the software for oil retail station management (EGAS). ERP and EGAS are technologies that use devices, software, computers and the internet to connect pumps, oil depots, tanks, petrol stations and computers to establish data for the management work to make accurate decisions and achieve optimal effects. Additionally, Petrolimex Quang Ninh manages a cargo quality management software and technical infrastructure management software for the whole Company. As shown, among the many member companies of the Group, Petrolimex Quang Ninh has always been the first to complete financial statements, which shows the capacity of mastering technology of the Company’s staff. Applying information technology, proactively setting up and operating software systems for production, business, and corporate management activities at Petrolimex Quang Ninh are exactly IoT (the Internet of Things) and IoS (the Internet of Services) – the basic characteristics of the industry 4.0. The terms Internet of Things or Internet of Services seem “too specialised”, so Chairman and Director of Petrolimex Quang Ninh Nguyen Dong tried to make it simple. He said, through decades, generations of leaders and workers at Petrolimex Quang Ninh have applied information technology into corporate administration to meet management requirements from commodity management, quality management, property management, personnel management to monetary management. “Once you are well aware of what you have in your “pocket”, could corporate management be most effective,” he said. Then you can carry out decentralisation depending on the function and task of each unit. It is hard to have a firm grasp on what we have in “pocket” and have effective decentralisation without the support of software for effective production, business and management activities under the context of PLX listing on the stock market and the current economic integration.